Founded on the principles of supplying the construction industry with the best possible service and satisfaction at the most competitive prices, Idaho Pacific Lumber Company Inc. (IdaPac) has developed a loyal following in its 37 years in the business. Based in Meridian, Idaho, IdaPac is an employee-owned company that specializes in providing contractors with top-quality wood products and building materials for large stick-frame construction projects. From framing lumber to engineered wood products, siding, hardware, insulation, doors and cabinets, IdaPac carries a range of tried and true products. IdaPac President Eric Grandeen has made a few key additions to the executive team in recent years, adding Rick Sullivan, chief financial officer and Scott Sunday, director of purchasing and sales to the staff. “Sullivan and Sunday bring a wealth of experience working for larger corporations in the forest products industry, which is invaluable,” says Grandeen, who has been running the company since 2011. Sunday, who came to Idaho Pacific following 18 years with Boise Cascade, was attracted Idaho Pacific largely for its unique, employee-owned culture. Having spent almost two decades with one of the forest product industry’s largest corporations, he was eager to take on a role with a company where he could help lead a smaller, more tight-knit team. “It’s refreshing to step in from a large corporation where change happens slowly and you’re a small cog in a large machine to a smaller company where you’re a larger cog in a smaller machine and one of the key people helping to make decisions,” he says. Idaho Pacific credits its longevity in the lumber market to a three-pronged approach. The company strives to not only be the supplier of choice for its customers, but also the customer of choice for larger suppliers and the employer of choice for its loyal employee base. “For us it’s about stressing to all employees who deal with customers and vendors that we need to have good relationships with BOTH and focus on continuing to be easy to do business with,” says Sunday. IdaPac currently has projects underway across the country, with urban areas in particular representing an ever-increasing percentage of the company’s business. These shifting demographics and desires have led to a boom in the multifamily residential housing market, specifically in large, urban areas. According to The U.S. Department of Housing and Urban Development, such projects now make up between 30 and 40 percent of all new housing starts, a figure that’s up significantly in recent years. This has been a boon to IdaPac, which has always had a strong presence in the large multifamily residential market. The company also serves the single family residential and the commercial construction markets. “Many millennials were entering high school or college during the economic downturn. Now they’re coming out of that with a lot of debt and realizing that owning a home is not necessarily an asset, so that changes their perception of the traditional American dream,” Sunday says. This younger generation is also far more mobile than in previous years, making them less likely to want to commit to a single-family home for the long term. “They’ll move up the ranks by changing jobs and want the ability to move if they need to, so we’ve seen a real shift from that part of the customer base who want to live in apartments, which is keeping the multifamily market very strong,” he says. This demographic shift has played out at IdaPac itself, where the company has worked to seamlessly integrate younger employees into the workforce. This has required the company to change some of its policies in practices in reaction to changing expectations from the workforce itself. “We understand that the old 8-to-5 deal is not necessarily how millennials are able to work so we try to be flexible, allow people to adjust their hours and at times work from the road or home,” he says. As a company that has long trained its own talent and promoted from within, IdaPac says there are ample opportunities at the company for the right type of workers. “When we hire people, we bring them in with a plan for them to be able to move several steps, eventually those interested could become traders. It’s a commissioned job, so you have to be willing to take risk, but for those who can sell there’s really a very high ceiling for them in terms of living they can make,” says Sunday. Looking down the road, Sunday hopes that a focus on diversification will help the company weather any slumps in the industry. Idaho Pacific added a door and millwork division in 2014, which still represents a growing segment of the company’s overall business today. A newly constructed office unveiled this fall will help Idaho Pacific work toward this goal. Using much of its own input, the lumber company teamed up on the project with a contractor who also happens to be an Idaho pacific customer to build its new home. “It’s an exciting move up and the first time in a while that Idaho Pacific has been in a space that wasn’t too small,” explains Sunday. Featuring an open floor plan, the new office has allowed for increased collaboration and atmosphere while increasing overall employee satisfaction. “It’s roomy enough for people and we set it up to be comfortable and efficient for our team,” says Sunday. 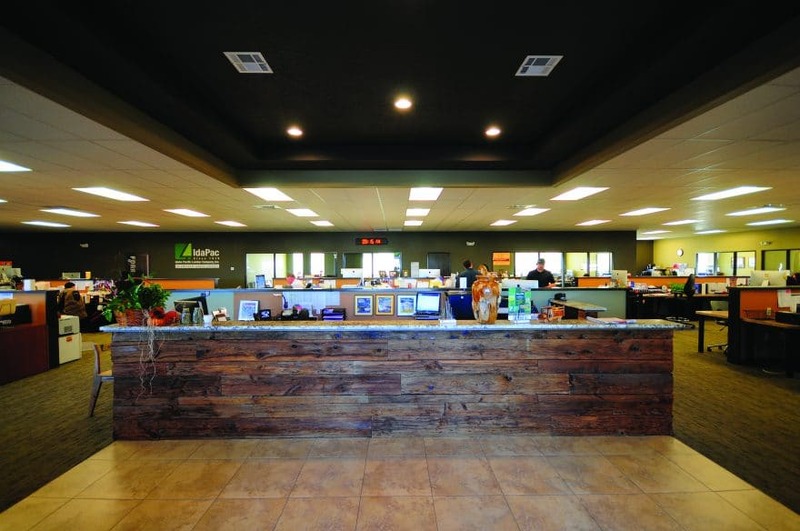 With new office space, a finger of the pulse of emerging trends and a unique three-pronged approach to success, Idaho Pacific Lumber Company will remain a leader in its market for the foreseeable future.